Thin Blue Lines, Tenkara-style part 1: the streams, and fishing them. JUST KIDDING! 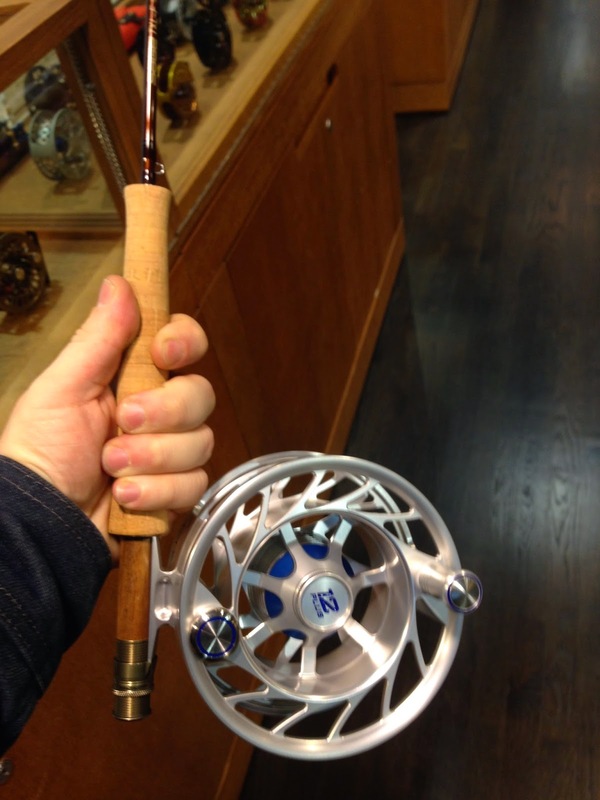 Obviously this is the opposite of everything "tenkara" in one photo, couldn't resist a good joke, pardon me... With so many people buying these crazy huge reels and all, it just looked so funny that I had to snap a photo. What is a thin blue line? The above photo is an example of a particularly small stream... do you think any fish are there? Most people would say no. In fact, I think they'd laugh. But there were at least 2 brookies hiding in the leaf litter of this run, that scattered as I approached to fish the pool above it. Streams like this harbor native fish, mostly the revered brook trout. This is the "pool" above the run. Don't be fooled, this pool held fish. I got some hits from fish that were either too small to hook, or I failed to set the hook. In higher water situations I might have scored a decent fish here, but the low and slow water made the fish particularly spook-worthy this day. This beautiful thin blue line is on the less-thin side. Often these streams provide larger fish, but there aren't as many native fish. Also, the higher the flow, often the harder it is to spook the trout as you approach the water's edge. The key is to move slowly, stay low, and wear clothing that may help camouflage you better. Although it often means catching smaller fish, there is so much reward in the native trout you'll encounter... their beauty is unmatched! As is the beauty of the surrounding environment. You're likely to see many animals and birds... they make the area surrounding the rivers their home. Often you'll hear the owls start to hoot as it gets dark... that tends to be a prime time for catching fish if you're in the right places. Fishing thin blue lines with a tenkara rod offers its own unique set of challenges. After walking up a small feeder stream, I came upon this beautiful pool. But before I was close enough to even snap this photo, the fish were aware of my presence... I saw a fin break the surface as a couple of trout bolted for the cover of the "waterfall" and the rocks below. Sure, you might succeed with a 20 foot line, but that's not really what Tenkara is all about. Sometimes its nice to also your traditional rod and reel along for these moments - which I usually don't. This "typical" thin blue line represents all the things a prime small-stream has to offer... lots of cover and hiding spots for the fish, picturesque surroundings, and no other fishermen in sight. Bonus points if you catch the trout resting under these fallen trees... And here's where the BENEFITS of tenkara come into play. First off, with a fixed line, you get very used to your casting range. Without needing to worry about or deal with the extra line and reel, the long leader or the tree cover behind, you can get very good at casting your fly into extremely tight spots between branches and under logs. And even better, your back-cast can be adjusted vertically, so you just need clear sky above, not space behind. Here's a textbook plunge-pool, the kind that gets me excited. I spent some time fishing from behind where this photo was taken, casting into the pool I'm standing in now. After fishing for a few minutes and getting nothing, I moved up to where the photo was taken and cast into the pool ahead. Sure enough, there were many brookies hiding in front of the rock in the far pool. I watched a few chase my streamer but none took it. After a few missed fish, the rest of the the pool's residents were spooked. Frustrating, but so much fun just the same. Coming onto this scene, above, most anglers would focus on the lower pool, which likely holds the largest fish. But again, here's an advantage to tenkara on small streams. Most of those little pools above the main pool also held fish. A long leader and short rod make it much harder to fish small pools like this. However, with a 7'8" Tenkara-style rod, a 6 foot furled leader, and 2 feet of tippet, you are going to reach all the pools before the fish see you, and you're going to get a perfect drift every time. There's something so satisfying about fishing every pool. Another important aspect of small stream fishing is movement. Not just how you move, but how often and where. I am a huge proponent of fishing up-stream. The fish have a harder time seeing you coming. This is particularly important in smaller streams where your presence is more obvious to the fish. Unlike larger streams and rivers, where anglers are often rewarded with large fish for "sticking it out" at a well-known pool, there is no such reward in a small stream. Once you've walked in the water or caught a fish in an area, the fish know you are there. Move on. Same goes for if you haven't caught anything after maybe 12-15 GOOD casts. Maybe the fish are in a different pool... covering more ground pays off when it comes to thin blue lines. Using the above photo as an example, another of tenkara fishing's small-stream strengths comes into play here - reach. There are a number of fishable spots in this photo. However, there's no room behind to cast enough line out here. The extra-long tenkara rods allow for you to stand on one side of an obstacle and fish the other side without the fish knowing you are even there. Sure, a traditional 8-9 foot fly rod could do this too, but it sure won't contribute to the fun in landing these smaller native fish. Standing on the left side of the rock in the center, you can fish the right side of that rock. You're hidden from view and from creating disturbances in the water that would send the fish scattering. So spend some time fishing the "thin blue lines," just don't share your secrets when you discover one that's really good! And please, practice catch and release fishing on these streams, help the native trout populations thrive... a fish properly handled and released is one that can be caught again! In the next post, I'll cover the small-stream tenkara rods that I like to use, and the different options for line, leader, tippet and fly. There I was pouring another wine tasting as usual. It was a typical Thursday night on the Upper East Side in Manhattan. "$15 champagne? Nope. How about some Prosecco? No, don't buy the Veuve Clicquot!" On the way home I caught a ride in a new and "exciting" yet unsurprisingly dirty, smelly, rainbow-wrapped advertisement that was the L train. Just look at this wonderful scene. The holiday busy season was right around the corner too. Yeah, I was ready to skip town. My friends and I had planned a weekend trip to traverse the ridge across Colvin and Blake's peak as an out-and-back, with a base camp below so we didn't have to carry packs. We'd leave Pinnacle for another time and a longer trek. So instead, I decided I'd finish work early on Friday, drive up earlier than my friends and get a few hours in on the Ausable, figuring I'd miss the crowds due to the cold forecast. I'd then hike in alone to a pre-chosen campsite with a backup plan, just in case. They'd meet me very late as they arrived after work. Things didn't really go as planned, starting with work not getting done early enough. Then the weather forecast went in a very negative direction, peak-wise. And it was going to be VERY cold at night. The bad weather would bring warmer air and relief from the cold, but likely would block our views. But nobody wanted to reschedule so the plan was on! We all relished the opportunity to escape our busy city week and packed the rain-gear. I fished a few pools in the next photo and landed 2 fish. Because I stupidly forgot my net, I had to use my hands to land the fish and take the hook out. Both fish wiggled away well before my freezing hands could juggle for the camera. Argh. Then it happened. A work emergency. Someone was out of wine for the weekend and I was a long way away. I had to quickly pack up, get back to the car, and try to create a solution. After a few phone calls and a minor bug-out, the situation was solved. At this point it was dropping close to 40 degrees and windy, and the sun was setting. It was time for a hot meal at the ADK Cafe. After an amazing meal I drove to the parking lot near Giant and the Ausable club, parked the car and got ready to hike. It was likely under 40 degrees and approaching the 35 degree low forecast for the evening. When I got to the sign-in at the end of the road, there was a new paper sign... can you read what someone wrote in on there in the photo, below... the "small print?" WHAT??? Luckily that's not where I was headed! I finally arrived at the pre-chosen campsite and was VERY annoyed and somewhat disgusted to discover a hammocker strung across the middle of the side-trail leading into the campsite. You can imagine my further horror upon discovering that some kind of hammock-gathering and possible general mess was occurring back here. Mind you, its now after midnight and everyone is asleep in their various hammocks. Like 6 or more of them. They had hung over all the tent-sites instead of taking to the trees around the tent sites on less flat ground, and therefore this site was out. Not ideal. Why was it so crowded? This wasn't a holiday or prime weekend and it was only Friday night. I got to the backup site a few moments later with my stomach in my throat... what if it was full? What if a lot of people were out here this weekend? My friends weren't arriving for another two or more hours at least and we had no way to communicate. All was fine, one other small tent and a few other sites for their tents, so no problems. I set up my Solplex tent and hit the sack. Next thing I know my friends were here and setting up. I looked at the time... 4AM. Jeeze. I'm sure I'd hear the story the next morning. I had to layer up in the morning while filling up at the stream. I love the blackrock gear hats... very warm, expert construction, great fit, and lighter than any hat I've ever had before. While filling up water, I heard stories of many delays from the night before but nothing exciting. At least it wasn't raining, right? This picturesque, cold and crystal-clear mountain brook actually holds a select few beautiful wild trout. I've seen a few of them "hanging out" in some unnamed pools. 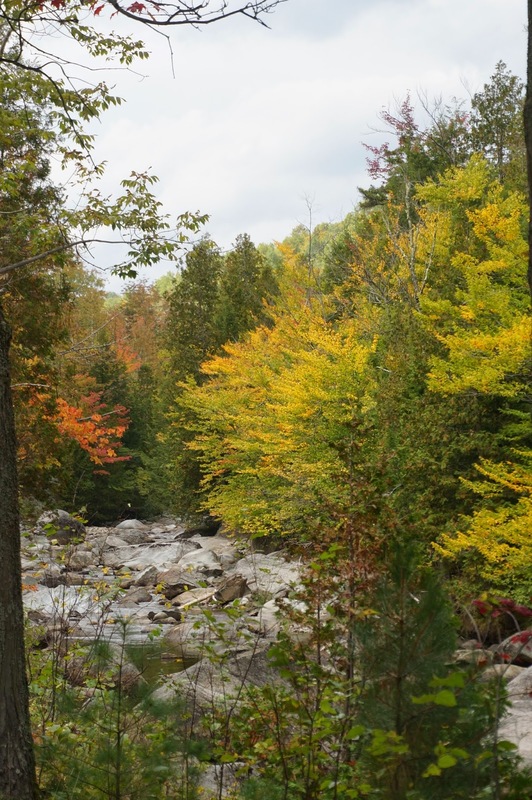 Unfortunately, this is all private Ausable-club owned land, and therefore you cannot fish it. At some point there is a cutoff with state land, but likely that upper section is too washed out to hold any fish worthy of spending time hunting for. 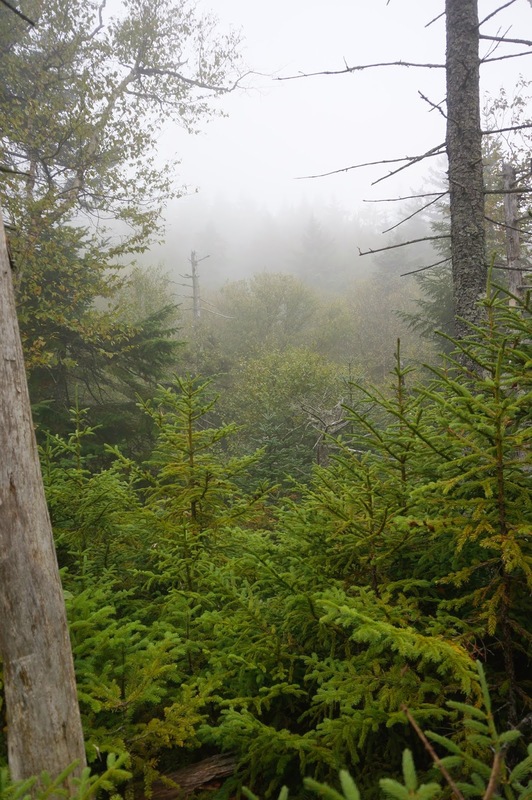 We set out on the trail to the ridgeline in the morning fog. Some blue sky threatened to show through, but it was a real battle and the clouds were clearly winning. We ascended wet roots... while it wasn't raining, a fine mist hovered in the air. 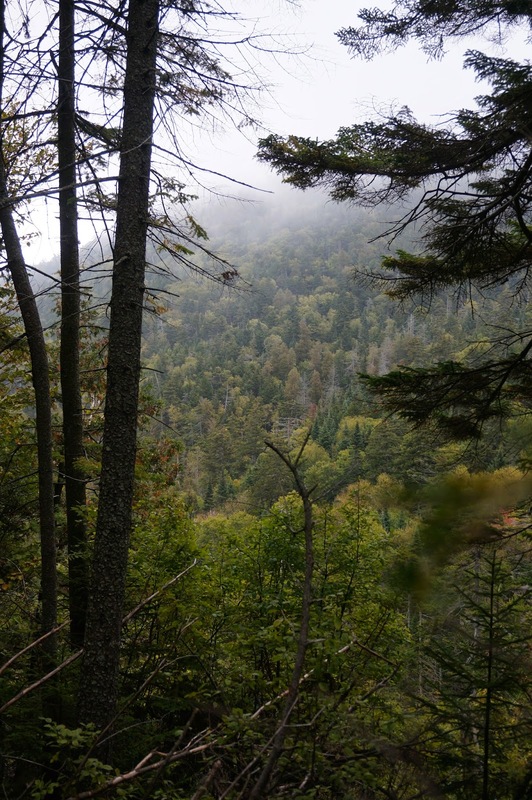 Mist floated here and there as the micro-climates of the forest fought the changing air temperatures. Even if the views of the valley were not revealing themselves, we had plenty to marvel at, with mysteriously flat and moss-covered cliffs that towered into the cloud of fog above. Soon we were at the top of Colvin and soaking in the "view." We didn't stay long, we still needed to get out to Blake's peak and back. We decided to find some shelter between the peak and the col on the other side to eat some lunch before summiting Blake's-peak. Some ants were also eating lunch with us, devouring a tree next to me. Everything was dripping but there was no actual rain falling. The view from the col, then Blake's peak was upon us. On the way back we could see some of the surrounding mountains and valley. 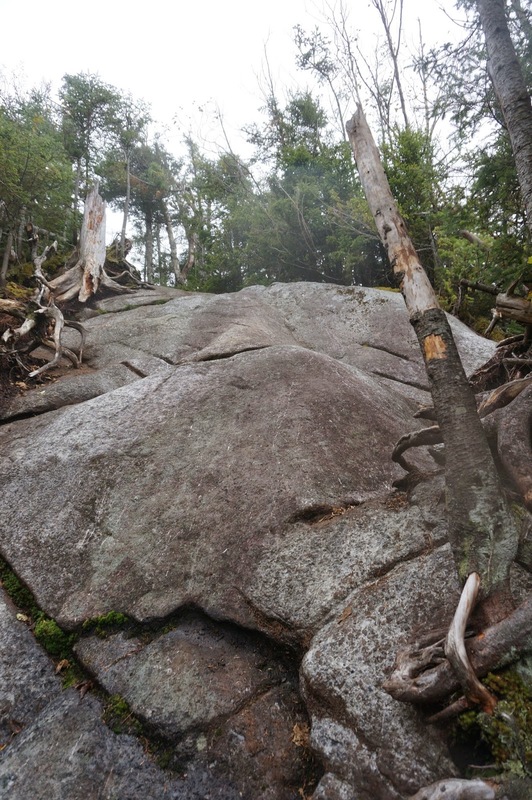 Lichen covered everything... trees, rock, earth. We got back after dark and destroyed a few packets of ramen and whatever cookies we had left from the day. Hitting the hay early was not even a question and frankly I was extremely impressed with my friends having been so all-out after so little sleep, not only with no complaints, but eating it all up with joy. Now that's proper peak-bagging attitude right there. I don't know if I would have been as excited as they were had I come later with them... the extra two hours of sleep was likely keeping me going. The next day we woke to some sun and the regret that comes along with being on the ridge, peaking, on "the wrong day..." it was nagging me. But is there ever really a wrong day for an adventure, I reassured myself? We were all happy about the experience the day before, views or no views, so I pushed through it with a smile. On the way home I stopped at a favorite road side pull-off to snap a photo and spot for late-season fish. I was cold and saw no surface-action so I didn't even wet my line. It was more of an after-thought than anything else. This lonely tree stood as a beacon in all of its grand color on this partly-cloudy day. 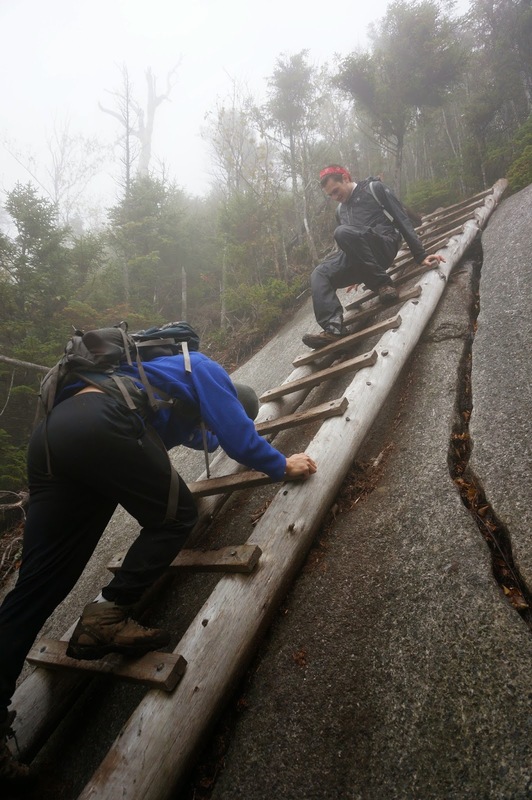 The hike was over, fall was taking hold in the mountains, and another few peaks had been crossed off our list. I said goodbye to good-ol' route 73 and headed home with a great feeling, knowing that soon I'd return to another part of the Adirondacks to fish for Native Brook trout in the West Canada Lakes Wilderness. But that will have to wait for another post! I was feeling like my wall needed some new art, so I stopped in at a gallery on the Upper East Side a few weekends ago to pick up some prints to have matted and framed. 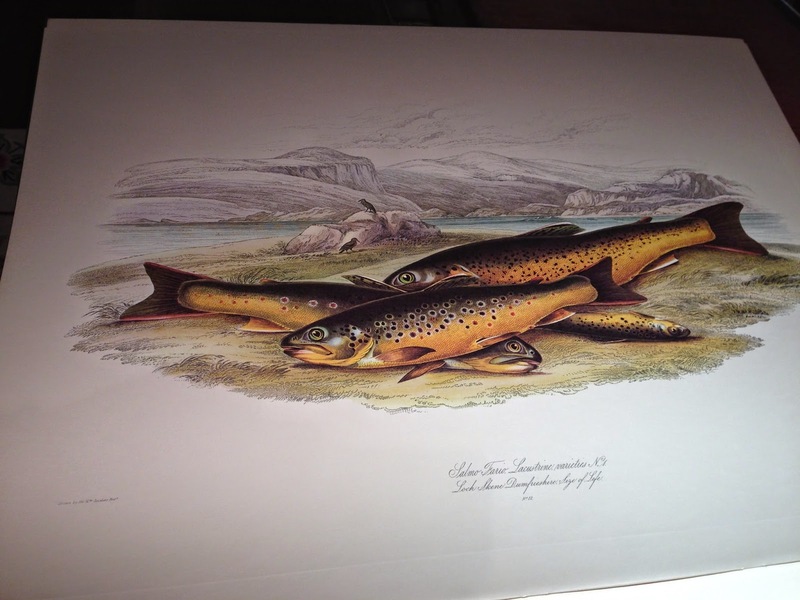 The trout and salmon prints are really expensive and harder to find, so I was looking mostly for other stuff. "Jardine was a keen sportsman, expert with rod and gun... He was also an amateur artist, working in watercolours, and exhibited, as an honorary member, at the Scottish Royal Academy, as well as other art exhibitions in Dumfries. When writing his books, he learned to etch, to draw on wood blocks for wood engraving, to lithograph and to use a variant of lithography called papyrography. 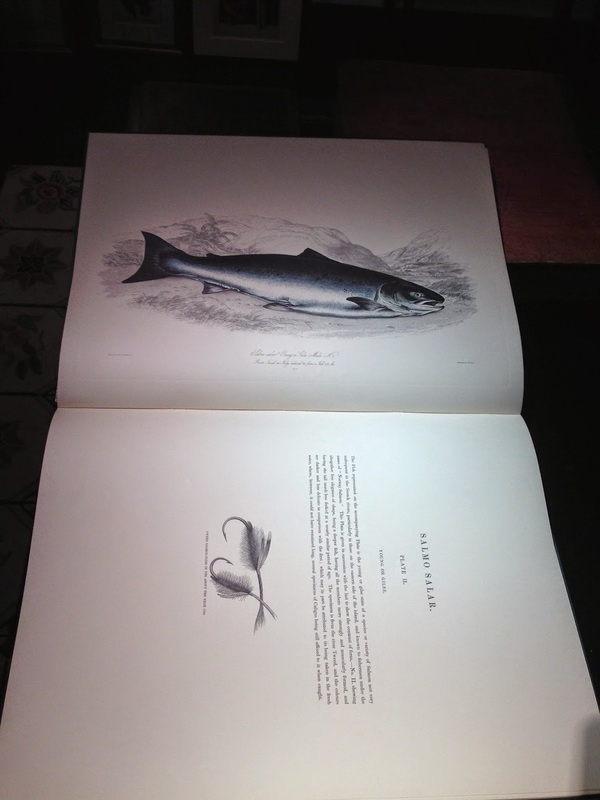 One of the finest books of fishes ever printed was Jardine's "The British Salmonidae", for which he did the drawings and etchings himself. 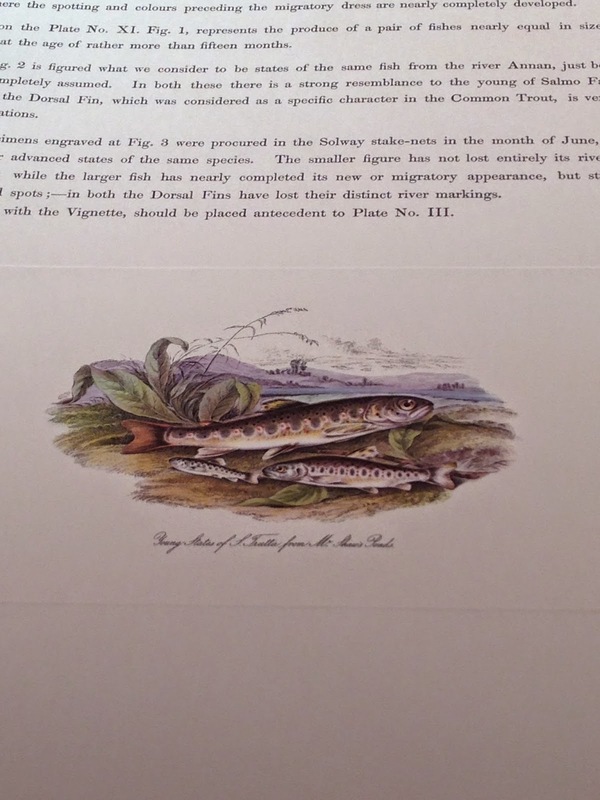 Jardine was the foremost ichthyologist in Scotland, perhaps even in the United Kingdom, in the nineteenth century. He was a fine fisherman and fished the Annan, which flowed through his grounds in Dumfriesshire, and the best stretches of the Tweed when he lived for three years at St Boswells, Roxburghshire... His reputation as a fly fisherman was well known, and he enjoyed many days of sport with other eminent naturalists such as P.J. Selby, John Gould, Richard Parnall, as well as friends and neighbours. His interest in fishing and fisheries led to his appointment as one of the royal commissioners to the Salmon Fisheries Survey of England and Wales in 1860." (Jackson and Davis, "Sir William Jardine. A Life in Natural History", p. X). I ended up buying a set of 4 dolphins and whales and having them matted. Here's the whale. If you click on the picture it will show up a little larger, and you can see the scene depicted within. Its not just a sketch of the whale, its an "action shot!" Take some time during the cold months to visit your local antique print shop/book store. And if you see some Jardine Salmon or Trout prints for sale, for goodness sakes, drop me a line! Stay warm out there this week. Flooded areas like this are common even in drier parts of the year, but we were there in the spring, making it even worse. 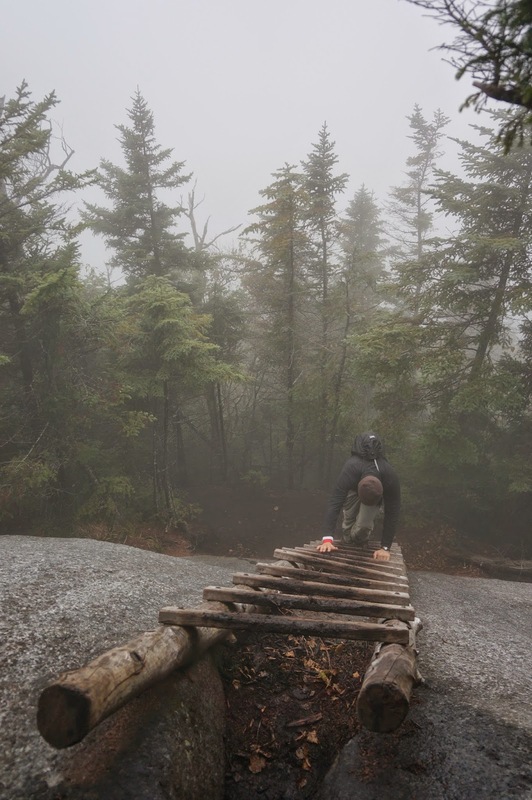 However, with risk comes reward, and so we were able to enjoy what nature had in store. The trail was messy but not as bad as the previous trip. The first afternoon was all rain. After a few miles, we were almost at the site. I had already gone in over my boots while crossing a stream, and was ready to get into some dry clothes and warm up. We stopped for a photo near the campsite. I have seen some small fish here, but I think the beavers keep the population from getting large enough to fish. The next morning the sun was teasing us a little bit and the skies promised slightly better weather. 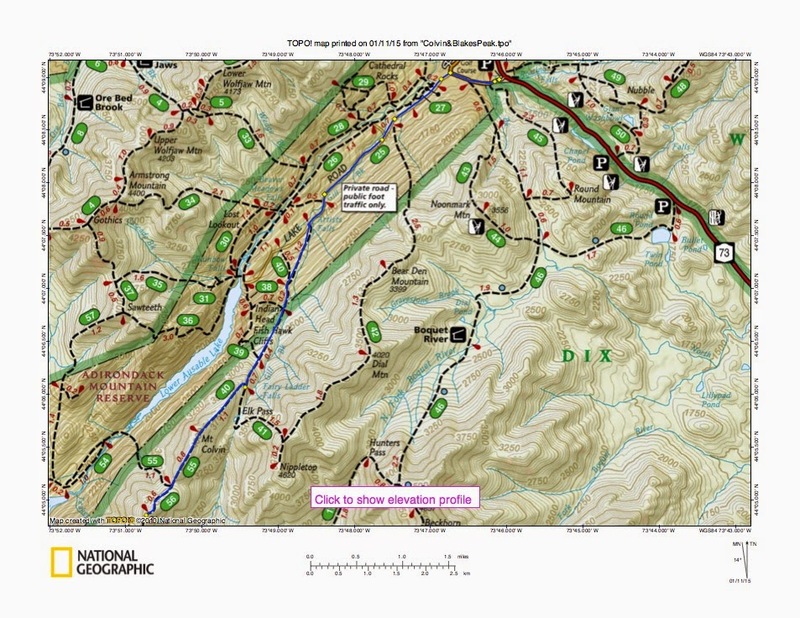 We discussed options and decided that because the best weather was forecast for the following day, we'd put off the ridge for that day, and we'd do a day hike out to Duck Hole and back, scouting some small streams. We left camp set up and headed out in a light mist. Yes, the trail is a stream on this day. Hence why I don't always hike in trail runners! The sun finally came out and the trail emerged from the forest. We followed the stream as it tumbled down into the valley and began to flatten out. Sometimes you find the fishiest looking water up in the high peaks region and think there must be fish in every pool and under each overhang. Unfortunately I've found from experience that a good number of these streams don't hold a single fish that I can find. Such was our luck this day. 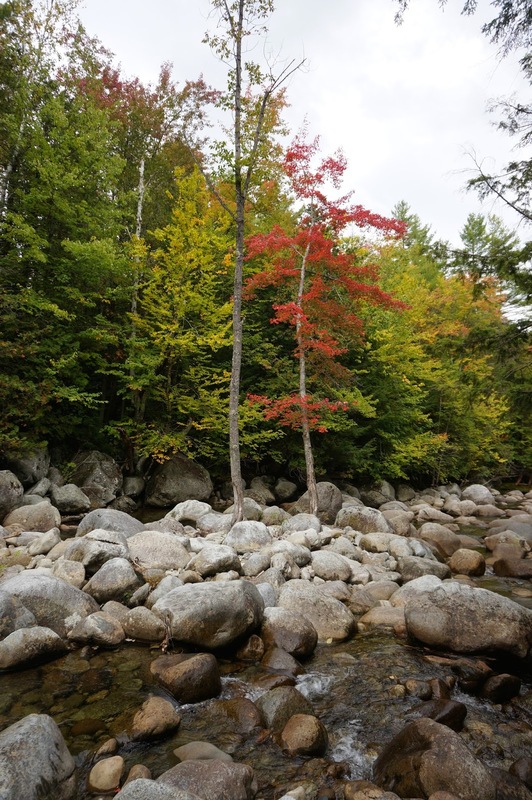 Sometimes I have to throw a line in to check out another section, especially one as beautiful as this, but most often I find that the streams up high in the ADK just don't support life beyond crayfish and frogs. I'm not yet sure if this has to do with lingering effects of acid rain, which once decimated the fishing in this part of the state, or if it has more to do with the force of water that so frequently washes these rocks clean. Even the river this empties into has yielded not a single trout in the 3 times I've fished it. Yet somehow, just over the ridge, not 10 miles away as the crow flies, I've fished some of the most healthy wild trout water in the area. Sometimes I just have to accept that my best option is to enjoy the view and leave my rod strapped to my pack. And boy is there plenty to enjoy along the trail, fishing or not! But how could there not be fish in this water? It almost makes no sense. Argh. I ended up falling into the stream while crossing more than once. I'm giving up on the Asolo Reston WP boots I have been testing out this season so far to avoid further injury - they can't even hold grip on flat sections of wet rock. What a shame - they are the most comfy and lightweight waterproof boots I've ever hiked in. But they are useless with the rubber sole they have now. My photos from duck hole were lost due to my phone taking a swim, but we had a great day and returned to camp tired and once again our clothes were damp but spirits were high. 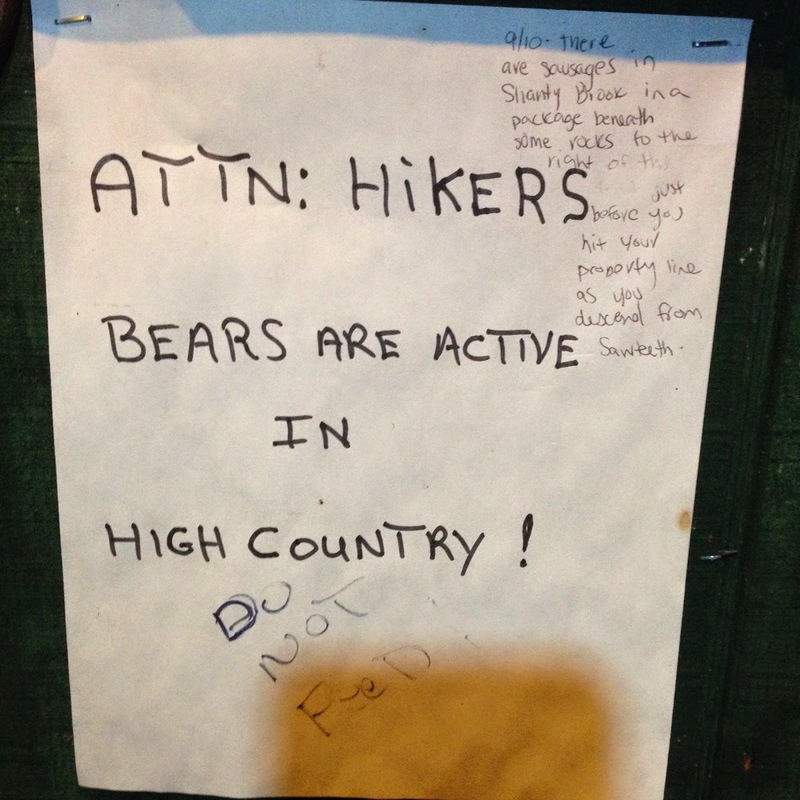 Fires are allowed in this part of the high peaks and we were glad to have one that night. Next morning we woke up to full sun and warmer temperatures. Perfect ridge day! 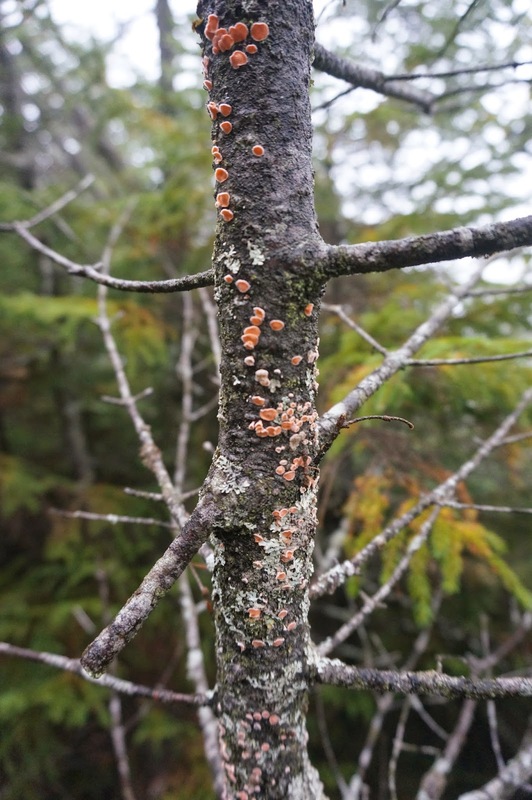 We had a bushwhack of Couchsaraga planned for the day and it would not be an easy one. We crossed the beaver dam and headed up the ridge along a beautiful cliff. 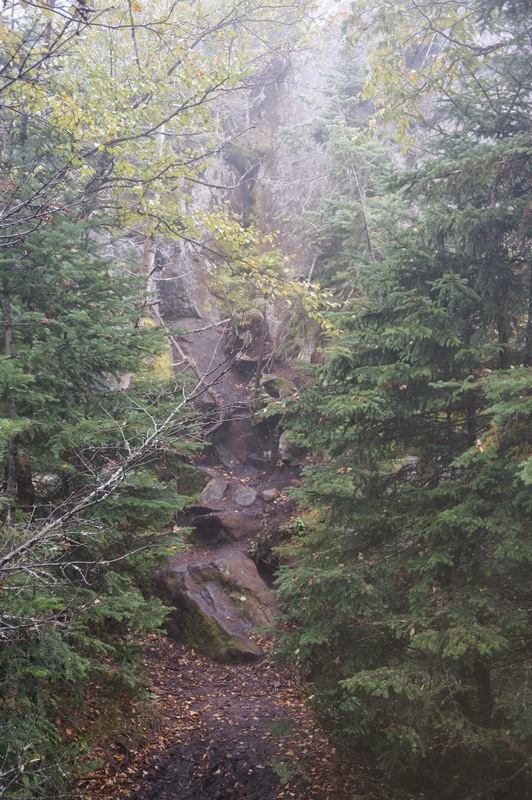 The trail crosses a stream and the cascading pools begin. Plenty of amazingly fresh and cold water to drink on this hike - no fear of dehydration for us. Even though it was early June, there was still ice left in the dark spots along the stream and trail. As we got higher the views got nicer, the trail got muddier again, and the harder work began. The views and good company were all that kept me going, as my ration of snacks ran out way too soon. Crossing the epic bog that I had heard people speak of for years as a thorn in their side was quite an experience. It was worthy of its reputation. 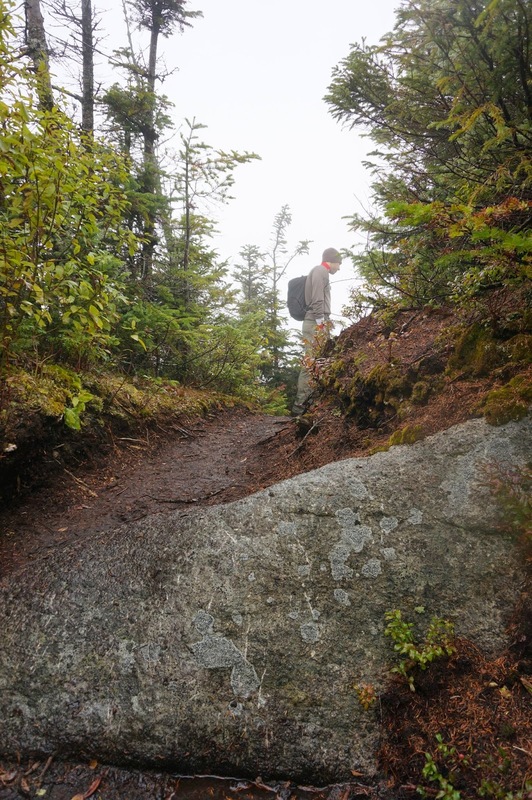 However, being well-versed in the ways of crossing such bogs in the ADK backcountry, I quickly found us an ideal trail of logs and fallen branches to keep us dry and above the knee-deep muck. Make no mistake, that mud will eat you up like quicksand and you'll lose a shoe faster than you can say "yuck!" But the summit couldn't keep us at bay forever, and we enjoyed some lunch and short nap and headed back to punish ourselves even harder on the hike back. I had no energy left for photos after this point, and I knew that it would just be a repeat of what I had already seen. I left the camera in my bag and hobbled back to camp. I was slightly disappointed not to have found any prime fishing water on our hike, but we got to experience the glory of this part of the Adirondacks in every way. I made some notes on my fishing map when I got home... we will be back to explore the other side of this wilderness next year, and we'll find the fish yet!